Difference Between Cold Pressed Virgin Coconut Oil and other Coconut Oils? Coconut oil initially gained a bad reputation due to the preparation process, also known as hydrogenated coconut oil where unsaturated fats were made saturated, to make these oils last longer. These oils are heated to high temperatures and combined with hydrogen to turn it into saturated fats, definitely bad for your health, particularly your heart!. Saturated fats collect in arteries and can lead to blockages. Refined Coconut Oil is basically based from dried coconut, or also known as copra, which is produced from drying the coconut either via smoke, sun or kiln drying or some other drying methods. Copra is produced as it’s easier to transport and refined into various other produce. Copra is then turned into coconut oil via the RBD process (Refined, Bleached, Deodorized). Bleaching here does not mean there are chemicals added, rather a filtering process to remove impurities via a bleaching clay. The deodorization process involves using steam to remove unwanted odor and taste from the copra. Research has indicated that the cold pressed method produces the highest level of antioxidents in virgin coconut oil. 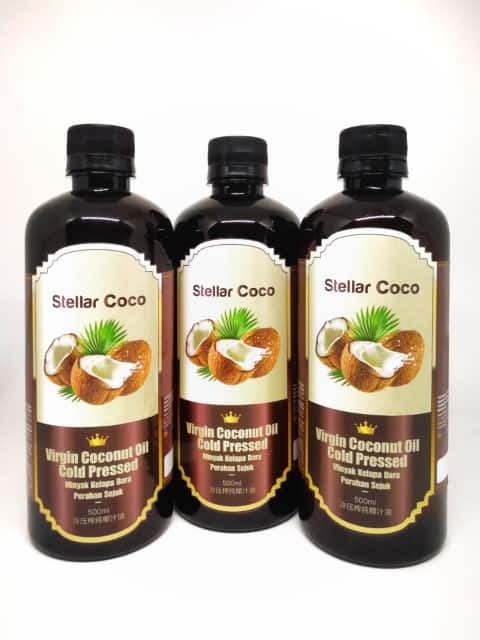 Cold Pressed Virgin Coconut Oil is produced via the wet milling process, where the oil is extracted from the fresh coconut without heating or drying up the coconut, producing “coconut milk”, a combination of water and oil. Oil is then seperated from water via boiling, fermentation, refrigeration, enzymes and mechanical centrifuge, providing one of the best form of edible oil. Research has indicated that this method produces the highest level of antioxidents in virgin coconut oil. Which form of Coconut Oil is better? Hydrogenated Coconut Oil must be avoided as the trans fat content in it would adversely affect your health. Refined Coconut Oil is a healthy choice, however research has indicated the the refinement process has stripped away some of the nutrients due to the heating process. Cold Pressed virgin coconut oils are definitely the best option as it retains all the nutrients and has recorded a higher amount of antioxidents. 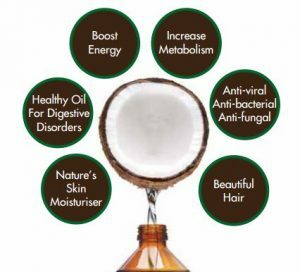 What’s in Virgin Coconut Oil that produces so many of these benefits? If you’ve not heard of this word, please remember it. It’s Medium Chain Fatty Acids (MCFA). These fatty acids are digested quickly so that the body can use them as a source of fuel rather than being stored in the fats, therefore it would not be circulated in the bloodstream like other fats. This is one of the key reasons tnat Virgin Coconut Oil does not increase the bad LDL cholesterol, great for the heart!. MCFA’s also contain antimicrobial effects against various forms of bacteria, fungi and viruses. Currently there’s an extensive research in identifying the effects of virgin coconut oil and the brain function. It’s concentrated on the ketones that are produced after the virgin coconut oil are digested and used as an altenative source of energy for the brain to carbohydrates (glycogen). This gives rise to using Virgin Coconut Oil in preventing neurodegenerative diseases such as Alzheimer’s, Parkinson’s, ALS, Apilepsy, dementia, schzophrenia and autism. Due to the high temperature tolerance of virgin coconut oil, it can be used as a regular cooking oil. It can also be taken as a supplement directly or added to drinks, smoothies and salads. Besides in the kitchen, it can also be used externally by applying it as an anti oxidant sun protection and moisturized hair & skin and infected areas. Stellar Cells produces it’s own virgin coconut oil. For only RM60, we’ll deliver a 500ml Cold Pressed & Unrefined Virgin Coconut Oil goodness to you! 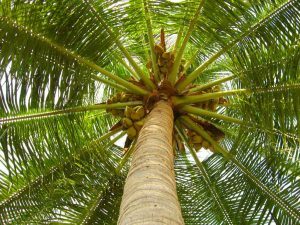 It’s coconuts are matured, fresh and sourced from organically certified plantations (USDA, JAS and European Union from Certified Plantation). It’s produced in a ISO22000 Food Safety Management System & Organiz Certified Manufacturing & Packing Facility (USDA, JAS & EU). Contact us and get yours now!